Enjoy delicious food with a focus on seasonal, local produce - a feast for the eyes and tastebuds! I chose this hotel for its stunning setting - the views are breath-taking across the River Trent and the surrounding countryside. If you like charming countryside retreats and good food you'll be right at home! 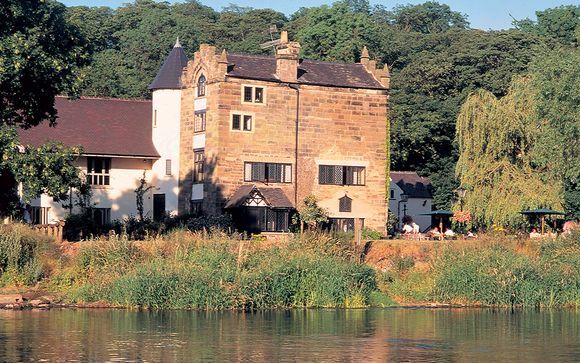 The Priest House Hotel is situated near the Derbyshire village of Castle Donnington, perched in a picturesque setting on the banks of the River Trent. The village borders the National Forest - perfect for stretching your legs before an indulgent Afternoon Tea. Derbyshire has plenty to offer for everyone- popular Donnington Raceway is close by, as are an abundance of serene country houses, such as Chatsworth House where Pride & Prejudice was filmed. Explore the stunning Peak District or the Rosliston Forestry Centre, where you can get to grips with orienteering, archery and many more action packed activities! The hotel is built around a Norman mill tower and the original watermills on the site of The Priest House were mentioned in the Doomsday Book in 1086. Part of the Hand Picked Hotels Group and set in a stunning location on the banks of the River Trent the picturesque location makes the perfect setting for romantic break. As you step inside you will find elegant contemporary surroundings fused with charming historic features such as cosy fireplaces and exposed wooden beams. The 2AA Rosette fine dining restaurant and the relaxed Brasserie provide two distinct atmospheres and seasonal menus to satisfy your tastebuds. 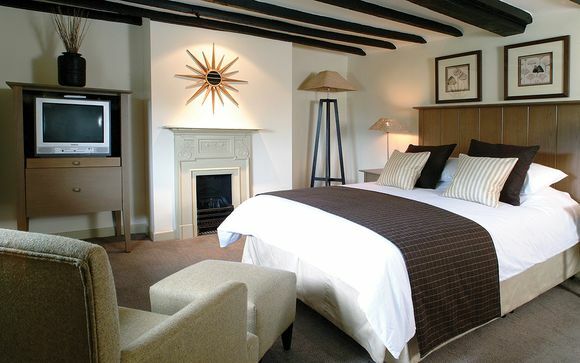 This offer is based on a stay in a Cottage Double Room. Just a short stroll from the main house, over a small bridge crossing a tributary of the River Trent, are the cottage bedrooms, which are believed to date back to the 17th century. The bedrooms offer a home from home feel, with all the comforts you would expect, which include comfortable beds, flat screen televisions, WiFi and exclusive toiletries. Fine dining is at the heart of the Priest House Hotel experience. Recently awarded two AA rosettes for excellence, you are guaranteed a true gastronomic experience. Expect seasonal dishes with a focus on local suppliers, such as leg of rabbit, pan roast scallops and Lincolnshire cheese boards. Decorated in a modern and contemporary theme, the Brasserie also makes use of the excellent original features of the Priest House Hotel. They serve a range of traditional dishes as well as some modern favourites offering an excellent alternative to fine dining with a relaxed and informal style of service. Why not book a quintessentially British dining experience such as Sunday Lunch and Afternoon Tea in elegant surrounds. The hotel provides a unique concept - workout bags to provide all the equipment and guidance you require without the need for a gym, kit or even trainers. Available 24 hours a day, free of charge. Choose from Gym in a Bag - A workout-based bag with equipment and instruction cards providing 3 levels of exercises to give you an hour’s workout. Exit the M1 at junction 24a and follow the signs for Castle Donington and Donington Park. At Castle Donington go right at the trafficlights and follow signs for Kings Mills only, marked 'no through road'. The hotel is situated at the end of Park Lane. Exit the M1 at junction 23a and follow the signs to Castle Donington. Turn left at the traffic lights and follow the signs for Kings Mills. The hotel is situated at the end of Park Lane.